A comma, not a full stop! The Comma (Polygonia c-album) is a very distinctive butterfly with an interesting history in the UK. It was very common and widespread in the early nineteenth century, but then its range contacted and it became rare, so that by the 1920’s it was hardly ever seen in Britain. From the 1940’s however, numbers started to pick up and it increased its range northwards again, as far as Scotland (1). There are two theories as to why this might have happened. Firstly, there was a reduction in the cultivation of hops (H. lupulus), one of its main larval host plants, which might have caused the decline; but there was also a marked cooling at the end of the nineteenth century which also might have been a factor (1). The fact that it started expanding again after the 1940’s, when temperatures started to rise, also reinforces this climate change explanation, but another factor has been a change of diet. Apparently, it has shifted its preference for feeding on hops to other more widespread species, including Common nettle (Urtica dioica) and wych elm (Ulmus glabra). The Comma seems to be quite an adaptable species; it is widely distributed throughout Europe, and specialises on different host plants in different places. Its flexibility in terms of what it is able to feed on means that it is able to respond to the changing climate; an example of a generalist, which we will hopefully continue to enjoy seeing in the countryside as global warming brings increased temperatures and changes to the native plant communities, in the UK. I still haven’t been able to discover what the distinctive white coma is actually for! 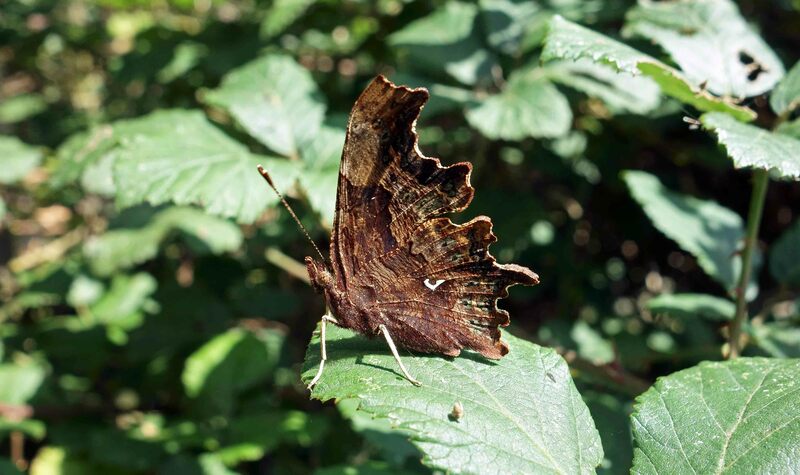 The Comma appears very much like a dried leaf in profile, especially the darker autumn form, shown here, and researchers have found that it relies on remaining still and cryptic, when approached by predators such as birds (2). In other words, it does not appear to use its white comma as a sort of flag to flash at and intimidate predators, or at least not in these experiments. Both males and females have these prominent white commas on their underwings; perhaps they use them to communicate with each other? Or perhaps they are a bit like epaulettes and no well-dressed comma would be seen with out them! 2) Adrian Vallin, Sven Jakobsson, Johan Lind, Christer Wiklund (2006). Crypsis versus intimidation—anti-predation defence in three closely related butterflies Behavioral Ecology and Sociobiology 59(3), 455-459. Next Next post: Blues on the heath! Ray Cannon's nature notes A comma, not a full stop!